Watch folks walk where The Beatles walked! Live 24 hour footage from the world's most famous recording studios webcam, Abbey Road Studios. 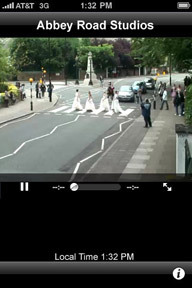 The studios webcam points to the iconic zebra crossing outside the studios, as featured on the cover of The Beatles 1969 best-selling album 'Abbey Road'. This app lets you enjoy live streaming of the popular London landmark from Abbey Road Studios and EarthCam. Also providing local London time and weather you can watch thousands of music fans, from all over the world, recreate the album cover on the crossing.